Home » 2011 Minutes » Rain Date for Owosso Speedway works out great! Rain Date for Owosso Speedway works out great! August 27th turned out to be a much better night for racing than our originally scheduled night, earlier in the season that got rained out. In addition to the weather being great, the club was also treated to the “Harold Morence Memorial” 54 lap Pro-Late Model feature race. It was a special night for the Morence family as Harold had been a huge supporter of the Owosso Speedway for many years, beginning his racing career there in 1964. Harold was known especially for having a perfect attendance record for 20 consecutive racing seasons. The racing action was full of action and fast paced in all divisions with some great finishes. 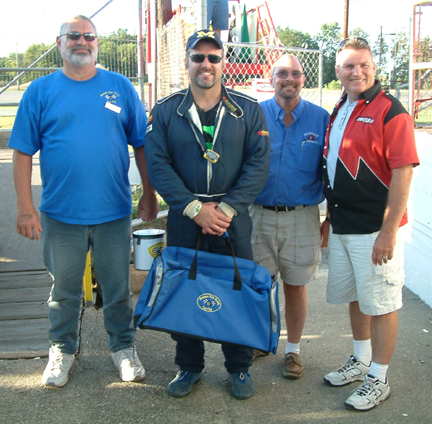 Our MARFC Helmet bag went to the driver of the #2 Pro Late Model, Jimmy O’Smith who himself has quite a long career at the Owosso Speedway. Our MARFC Member prize went to Logan Fischer. Our table helpers were Steve and Cory Russell, Dennis Trinklein, Dennis Schalm, and Barry Meschke. 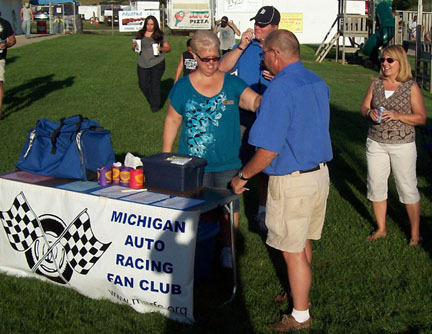 Many thanks go out to the Owners and Promoters of the Owosso Speedway Rick & Jennie Miracle as well the dedicated & friendly staff at the Speedway, especially to announcer Chris Fobbe for his many mentions of the club. Previous post MARFC Returns to Tri-City Motor Speedway! Next post Third time a Charm for MARFC at Auto City!